I’m not entirely sure how I came across this novel, (or how come I never heard about it before), which is a shame because some sincere thanks are due. 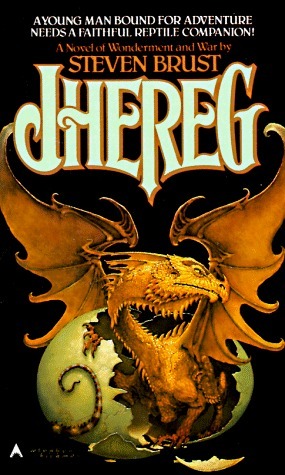 I’ve actually just read The Book of Jhereg, which encompasses the first three novels in the Vlad Taltos series: Jhereg, Yendi, and Teckla. The review therefore reflects the first three books in the series. Vlad is an outsider, a human amongst the long-living Dragaerans. He’s a professional assassin and a criminal baron (on a low rung of nobility, but still). The stories naturally involve his bigger adventures, the ones with plots that have the potential to shake the empire. Expect to discover a unique world, with its own complex societies and customs, unique races, thought-provoking magics, and long-running history, all through the eyes of an approachable and likeable anti-hero. I love the writing style, and find it engaging and flowing. The world-building is excellent, with nary an info dump. This leads to an immersive but curious world, as readers slowly build up the mental image of the world. The magic system is also very interesting, with given consideration to the socio-economic impacts of it’s use. For example, the usage and costs of assassination in a society were resurrection is available are handled well. The books are fairly short, making for quick (rather than epic) reads. I love a point being made well in less words. Still, with 15 volumes out of 19 planned, there is plenty to read and immerse yourself in. The books were not written in chronological order. Brust, at his own words, tried to make each book fairly independent, but those who are used to a series progressing linearly might find it a bit confusing. I like to read in written / published order, as I don’t mind the “flashbacks” and prefer to see how the author explores both the world and the protagonist’s life. If you must have chronological order, it can get quite complicated to follow the series. While the stories are of an assassin, they aren’t quite your modern dark / grimdark variety (note the publication years!). Violence isn’t as in-your-face gore as some modern readers might prefer. That isn’t to say that Vlad is a cliché heart-of-gold assassin either. He’s neither Elric nor Aragorn, but a complex, pragmatic criminal. Lastly, some of the other characters, while drawn well enough in terms of voice and personality, sometimes do lack a bit of depth. There just isn’t enough sense of them having a life independent of the main plot. To be fair, that seems to have improved in the third book (Teckla), and might be better handled as the series progresses. There are also the usual tropes of introspection by a first-person POV narrator, which I generally like but some readers may not. In short, I loved the books very much. This is superb fantasy, and while the series has 15 volumes (from the past 35 years), they are quick and entertaining reads. I definitely plan to binge read the rest. I recommend reading in publication order (so starting with Jhereg — or the three-volume omnibus The Book of Jhereg, which the only version available on Kindle). If you’d prefer to read in chronological order, you’d have to start with just the prologue from Jhereg, then jump around between books as per this Wikipedia article. It doesn’t matter that much though, as the books mostly make for individually packages entertaining reads either way.